Sharda founded NovoJuris in 2008 with a primary focus of making legal easy for entrepreneurs from starting up to scaling up and beyond. Previously, Sharda has worked with large Indian conglomerates and MNCs as their in-house attorney on various projects including – IPO, cross border transactions, acquisitions, takeovers, mergers, collaborations and intellectual property for nearly 12 years. During Sharda’s earlier employment with Intel in India, she was responsible for the South Asia Operations and in the Puravanakara Projects, she raised about Rs. 900 crores through IPO. Her stint with Manipal Group was in a range of businesses like – education, healthcare, lifestyle and consumer goods, brand valuations, real estate and more. Sharda has special interests in women businesses and chaired TIE’s Special Interest Group for Women Entrepreneurs. She is the India Trustee for ‘Baalemane’ – a loving home for orphan girls. 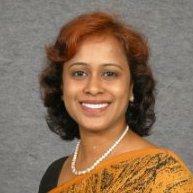 Sharda is a Lawyer and a Company Secretary, along with a degree from Institute of Chartered Secretaries, UK. She has a Diploma in Intellectual Property Rights from National Law School of India, Bangalore and an advanced certificate course in Copyrights from World Intellectual Property Organisation.